I love great wine but when it comes to wineries, I prefer casual, lounging experiences that feel more like an intimate meal with good friends. This list is built on experiences and wines I recommend to friends when they’re contemplating a trip to Napa Valley. I’ve also included special labels to build personal collections, wine clubs to check out, and a few exceptional bottles to drink on a Wednesday night. And lastly, here’s a comprehensive and very recent list of best dining spots in the Valley. My only additions would be Bistro Don Giovanni, Miminashi and Cook. Still dreaming about a magnum of their exquisite 2012 Reserve Cabernet that I enjoyed a few years back at a dinner party. It set me on a path to discover as many of their wines as I could get my hands on. Their reds have never disappointed and I’m hoping somehow to snag their sold out 2015 Viogner on my next visit. Turnbull is known for its spectacular deep reds and one sold out, splendid, Sauvignon Blanc. When I visited I was captivated by the wines as well as their B&W vintage photography on display in the gallery. For such unparalleled wines, the tasting room, surrounding grounds, and affable staff offer a down to earth, unpretentious experience against a backdrop of elegance and European charm. 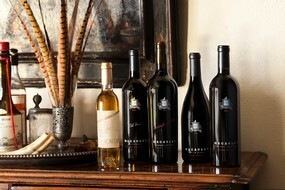 There is nothing like the Swanson salon in all of Napa Valley. It’s a one-of-a-kind enchanting experience meant to be shared with your most delightful friends. They are rightly known for their Merlot. Don’t miss the 2012 vintage. It’s perfect. This is where I steal away mid-afternoon with girlfriends for a little sunshine and their super drinkable sauvignon blanc. 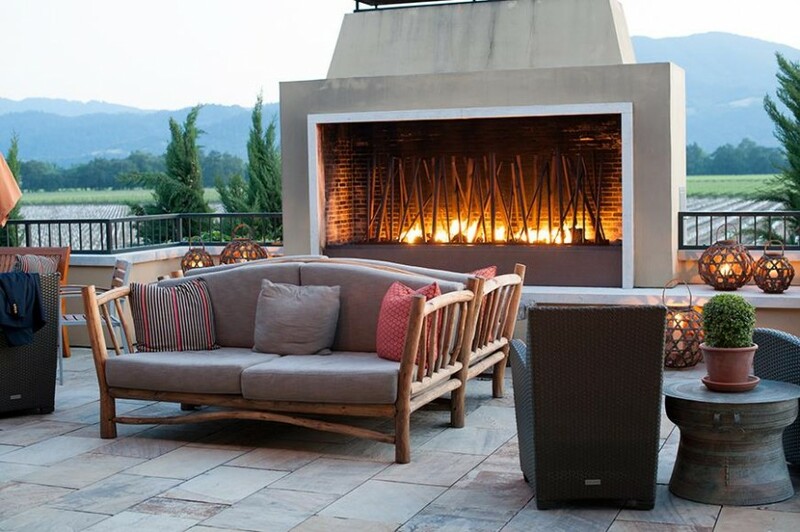 In cooler months, we cozy up by one of their fire pits and sip soul-warming cabernet. AO is not the place if you’re looking for a history lesson on Napa Valley wines and I’m ok with that. But it’s the perfect chill spot to kick up my feet and admire the valley vistas. This charming property has beckoned me many times over the years. I recommend the relaxed Cabernet Tasting which is accompanied by substantial nibbles, which many wineries don’t offer. It’s a perfect starter to a leisurely afternoon on the patio with full table service. If you’re in the mood for a decadent pit stop in Yountville, look no further than JCB. Bubbles and wine are available until 9p on weekends, which means you can pop in while you’re waiting on a table at Bouchon. Venge is not a stop-by kind of place but it’s worth the planning. I promise. This is a retreat for the senses and you can escape the masses with a private, yet casual, hosting for you and your five closest friends at their winery ranch house. I have been lucky enough to spend a cozy afternoon tasting in the Hunnicutt caves with some of my besties. It’s an intimate experience and we had our run of the place. We left with multiple cases of their to-die-for Zinfandel that continues to wow. These are some of the most stunning grounds in all of Wine Country and I am lucky to have tasted, dined, and partied here over the years. I love the vibe and the wine, but it’s winemaker Ron Nicholsen who sets this place apart. His knowledge of his craft is impressive and his easy approach to tastings keeps Kelham at the top of our list. The Quintessa experience is world class just like their wines, not to mention the architectural design of their vineyard. They offer a range of experiences for small and larger groups. My personal favorite is the a private tasting at the secluded pavilion on Dragon’s Hill. It overlooks the vineyards and the lake. 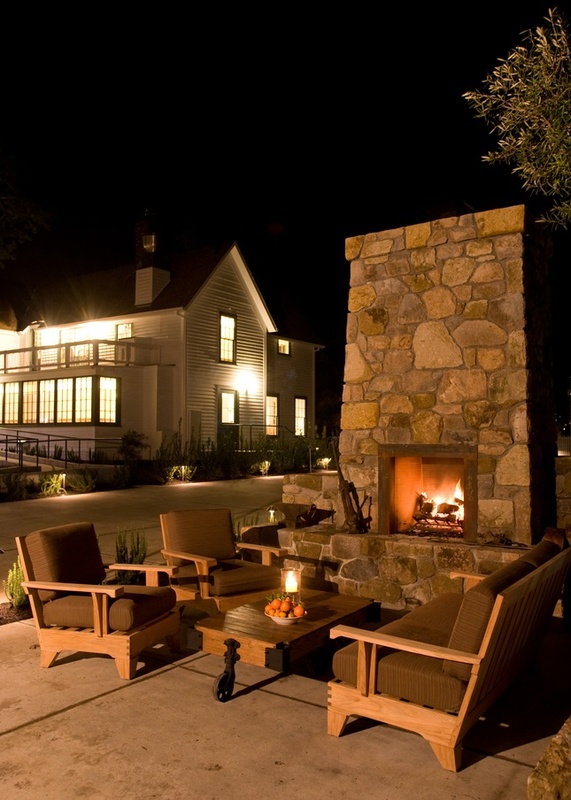 It’s appointment-only but it’s a quintessential Napa experience not to be missed. I could spend a whole day at Regusci, one of the oldest family ranches in Napa. It’s also considered a Ghost Winery (check out their Ghost Tour). Jim and Laura are impeccable hosts, known for their superb wines and and their gracious hospitality. Bring your kids, your dogs and your friends to spend a perfect day exploring the ranch, the gardens, and Regusci wines. 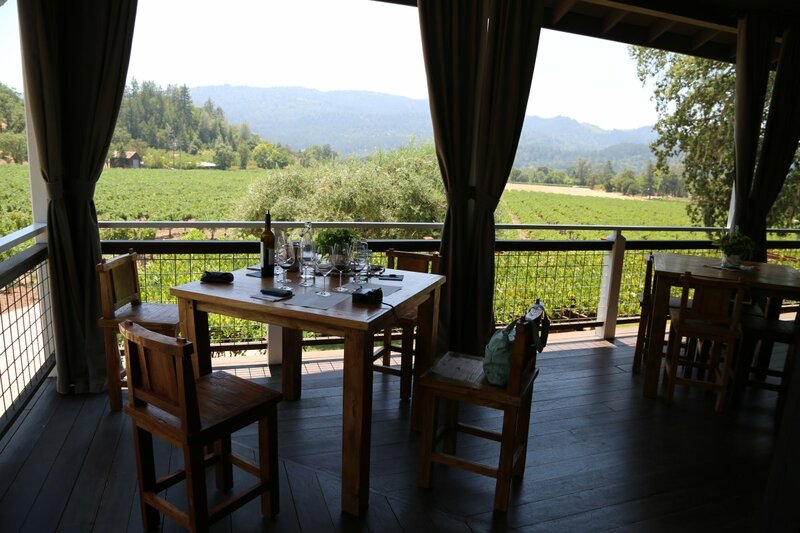 Gather your squad and head to the Backstage Lounge at Cliff Lede in the Stag’s Leap District of Yountville. You’ll have access to limited production wines, Bordeaux varietals and Cabs, as well as their stellar art exhibit and classic rock n’roll memorabilia. Reserve a Backstage Pass to taste wines not available to the public. I am partial to James Cole as they were my neighbors for 3 years. I certainly made the most of it with midday strolls to their majestic but super chill tasting room for a splash of one of their small production wines. Their reds run the spectrum from Zin to Cab to Malbec and their unique Jaden Icewine is a must-try. My first experience here was with a Hall insider and included homemade pizzas on the terrace and a late night tasting in their cave beneath a dramatic upside down tree festooned in lights. They also have stunning and art-filled winery on Hwy 29, however, I prefer this Rutherford location for its intimacy and privacy. Sometimes, the bottle of wine IS the experience. Here’s my hit list of less obvious labels–up and comers, small production lots, family estates and hidden gems to stock up on now. Rob and Angelina Mondavi’s 2013 100% Cabernet Sauvignon is elegant and spectacular. I got a sneak peak last week and bought as much as I could, as this vintage will be a classic. Only 100 cases were produced and its official release is November 1st. Luckily we have a direct line to this powerful duo and so if you’d like to secure your bottles before they sell out, email them directly here. I’m obsessed with the 2013 Peak Attelas Vineyard Cabernet Sauvignon from one of the newest and strongest players in the valley. This first estate grown vintage, from their Atlas Peak site is exceptional and you will want to drink this all year long. D66 is my latest must-drink from Dave Phinney, of Prisoner fame. It’s a beautiful Grenache from Dave’s winery in the Languedoc-Roussillon region of France. It’s hard to find but your local wine shop should be able to hunt it down for you. I’m also in love with Machete, which has the most original label we’ve ever seen. And the wine has serious attitude without the high price tag. Ok, so they’re not a Napa winery, but I have to give this under the radar winery props here since I’ve been drinking and raving about them since springtime. Their 2015 Rose was my go-to summer wine and I can’t decide which Pinot I love more. Gina prefers the Russian River and I prefer the Sonoma Coast. Guess we’ll have to keep tasting. I was gifted this incredible bottle of Acha 2012 Tempranillo and am now the proud owner of a case and a newly minted member of their Happy Ending wine club which is an all access pass to Mark Herold’s amazing small batch wines, including other favorites, Flux and Collide. 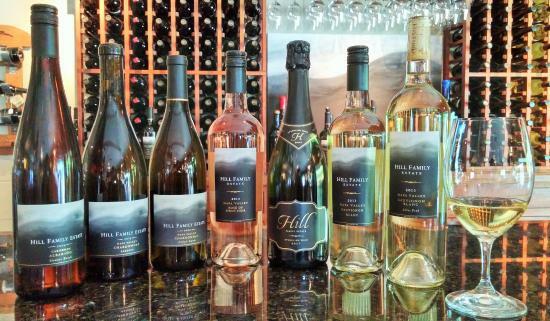 This is truly a family affair and the Hill’s wines are as easy drinking as they are. Favorites include their 2015 Albarino, 2014 Syrah and the 2011 Red Door. I love that you don’t need reservations at their relaxed Yountville Tasting room. This is Gina’s current go-to red for Fall. For under $50 this “mixed black” blend of Cab, Syrah, Petite Syrah, and Charbono tastes like a million bucks. Think cherries, dark chocolate, and roasted fig with a ripe berry luscious finish. With a bottle of this baby, you can lock us up and throw away the key. Every year as Fall rolls around, I start to dream about our coziest tasting spots and they always include a fireplace. I’ve spent the better part of a decade compiling my personal go-to list. My favorites are here. Warning: you might see us tucked away at any of these gems in on a Tuesday afternoon.